Mar 28th 2015 |IF YOU LEARNED that the top dogs in a particular market were the same as 100 years ago, you would probably surmise that the business concerned had suffered a century of stagnation. In the case of higher education, which has been dominated by American universities since the early 20th century, you would be quite wrong. It grew slowly for the first quarter-century, gathered pace in the middle half and took off in the fourth quarter. You might then conclude that the top dogs were truly outstanding, or that there was something very odd about the market. In the case of higher education, you would be right on both counts. America gave the world the modern research university. The American elite imported the model of the Oxbridge college in the 17th century to give its rough sons a polish. In 1876 the trustees of the estate of Johns Hopkins, a banker and railroad magnate, decided to use what was then the largest bequest in history to marry up the Oxbridge college with the research university, an institution the Germans had developed at the beginning of the 19th century. Both private and public universities adopted the model, and Harvard, Yale, Princeton, Caltech and the rest of America’s top rank emerged as the prime movers of the world’s intellectual and scientific life shortly afterwards. These institutions have produced a startling number of the inventions that have made the world safer, more comfortable and more interesting. “Imagine life without polio vaccines and heart pacemakers…or municipal water-purification systems. Or space-based weather forecasting. Or advanced cancer therapies. Or jet airliners,” wrote a bunch of America’s business leaders to Congress in 1995, pleading with the government not to cut research funding to universities. Since then, those institutions have also powered the digital revolution that has improved life in every corner of the planet. America led the world, too, in creating mass higher education. That transformation was driven in part by the economy’s need for higher skills and in part by society’s desire to give the men who fought in the second world war a chance to better themselves. America thus became the first country in the world in which the children of the middle classes went to college, and college became a passport to prosperity. Given its success, it is hardly surprising that the American approach to higher education is spreading. Mass education has taken off all over the world. The American-style research university is the gold standard, and competition among nations to create world-class research universities as good as America’s is intensifying. Spending on higher education is rising: across the OECD, from 1.3% of GDP in 2000 to 1.6% in 2011. Provision, financing and control everywhere is moving away from the European model, where everything is done by the state, towards the American one, in which the private sector provides a large part of the education and individuals pay for most of their tuition. But just as the American model is spreading around the world, it is struggling at home. America’s best universities still do more top-class research than any other country’s; the problem lies in getting value for money on the teaching side. Tests suggest that many students do not learn enough these days. They work less than they used to. The average performance of America’s graduates, compared with those of other countries, is low and slipping. Higher education does not increase social mobility but reinforces existing barriers. At the same time costs have nearly doubled in real terms in the past 20 years. The enrolment rate is falling. Technology offers the promise of making education both cheaper and more effective, but universities resist adopting it. This special report will argue that the problems spring in part from the tensions at the heart of higher education between research and teaching, and between excellence and equity; but that technology and better information can help make the teaching side of the business more effective. America, having exported its model to the world, could learn some lessons from other countries about how to improve its own system. “Everybody’s gettin’ so goddam educated in this country there’ll be nobody to take away the garbage…You stand on the street today and spit, you’re gonna hit a college man,” says Keller in Arthur Miller’s play, “All My Sons”, written in 1946. Higher education in America started to spread from the elite to the masses as early as the 19th century, with the establishment of the land-grant universities, but got its biggest boost with the 1944 GI bill that paid servicemen to go to college. What happened in America then happened in Europe and Japan in the 1960s and 1970s, in South Korea in the 1980s, and is now happening the world over. Student numbers are growing faster than global GDP. 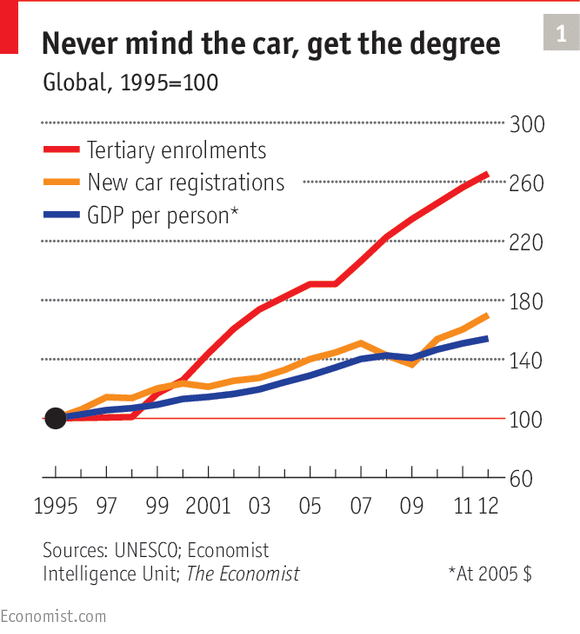 So hungry is the world for higher education that enrolment is growing faster than purchases of that ultimate consumer good, the car (see chart 1). The global tertiary enrolment ratio—the proportion of the respective age cohort enrolled in university—increased from 14% to 32% in the two decades to 2012; the number of countries with an enrolment ratio of more than half went up from five to 54 over the period. Sub-Saharan Africa is the only part of the world where “massification” is not much in evidence yet. Some countries, such as South Korea, where pretty much everybody goes to university, have probably reached saturation point. Others are still seeing phenomenal growth. In China, student numbers grew from 1m to 7m in 1998-2010. In the decade to 2009, Chinese universities hired nearly 900,000 new full-time faculty members. The country now produces more graduates than America and India combined, and by 2020 aims to enroll 40% of its young people in universities. All over the world labour-market changes, urbanisation and demography have fuelled the boom. The “knowledge economy” has increased the demand for workers with well-furnished minds. When people go to live in cities, universities become more accessible so more people attend them. Rising numbers of young people have fuelled the boom, and—especially in Arab countries—combustible politics increase the need to offer opportunities to teenagers. In most countries the number of 18- to 24-year-olds will shrink in the next half-century, but the demand for higher education seems likely to more than counteract that demographic effect. Simon Marginson of University College London’s Institute of Education reckons that “the tendency to growth of participation in higher education appears to have no natural limit” once a country’s GDP per person rises above $3,000. The laws of supply and demand suggest that this vast increase in the number of graduates should reduce the return on investment in a degree, and to some extent that seems to have happened. 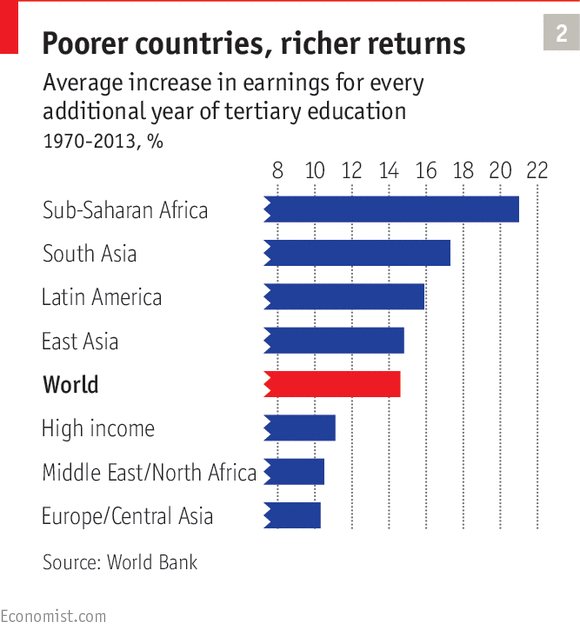 By and large, the return to higher education is higher in poor countries than in rich ones (see chart 2), except in the Middle East, where high enrolment combined with low growth has led to high graduate unemployment. 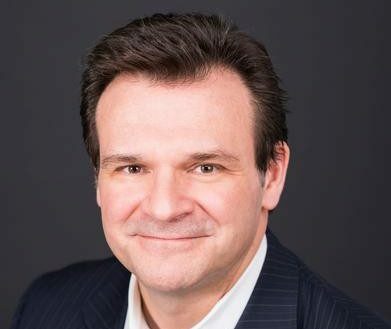 Harry Patrinos, the lead education economist at the World Bank, reckons that globalisation has increased the chances for well-qualified people in poor countries of getting a good job. In the rich world, even though nearly half of young adults are graduates and numbers are continuing to rise, the graduate premium (the wage difference between those with and those without degrees) has remained high enough for it to be worth going to university. Part of the explanation may be credentialism in some rich countries. The more people have degrees, the more employers will insist on recruiting graduates. In many countries jobs such as teaching and nursing, which did not require a degree 30 years ago, are now reserved for graduates. When just a small elite went to university, plenty of decent jobs were available to those with only secondary schooling. That is no longer true. But changes in the labour market also help to explain the ever-growing pressure to get a degree. Automation has created what Claudia Goldin and Lawrence Katz, two Harvard academics, have called “a race between education and technology” which only those with plenty of education will win. As automation depresses wages at the bottom of the pile, inequality grows, and the more unequal society becomes, the riskier it is not to have a degree. For all the stories of university dropouts who became software billionaires, non-graduates have little chance of joining the ranks of the prosperous few. As first degrees become standard, more people are getting postgraduate qualifications to stand out from the crowd. In both America and Britain, 14% of the adult workforce have a postgraduate degree; and despite the increase in supply, the postgraduate premium has increased in both America and Britain, especially since 2000. There was a time, points out Stephen Machin, professor of economics at University College London, when a postgraduate degree depressed wages; but that was when maths PhDs worked mainly in academia, not in the financial sector. Although individuals enjoy decent returns to their investment in higher education, it is less clear that society as a whole does. The big question is whether the graduate premium is the consequence of higher productivity or of establishing a pecking order. If universities increase people’s productivity, then society should invest in having more graduates, but if they are merely a mechanism for signalling to employers that graduates are cleverer than non-graduates, then it should not. And since little effort goes into measuring whether universities actually educate people—a matter to which this special report will return—society does not know whether investing in education is worthwhile. Even if the social returns on investment in higher education were poor, there would be a strong political argument for the state to provide access to it. If people need a degree to get ahead, then democratic governments must offer everybody with sufficient brains a chance of getting one. The market alone will not lend money at a reasonable rate to students who can provide no security, so even governments that rely heavily on private finance tend to offer loans to students. But access to higher education is not binary. Some provision is excellent and some is not, and the returns to low-quality higher education are poor. So the ambition expressed by pretty much all governments everywhere to widen access to good-quality higher education conflicts with another global force: competition to create the best universities.